Gumusluk near Bodrum is one of the best places to stay in Turkey! 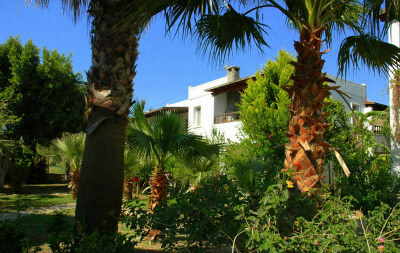 Just 150 metres from the sandy beach Alfa Apartments is set in the small community of Kadikalesi, a quaint village that has kept its laid back and unique charm. 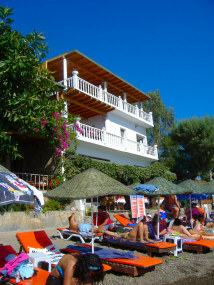 It is less than a 25-minute walk along the beach into Turgutreis town centre. It offers air-conditioned apartments, with private bathrooms, TV, kitchenette and free Wi-Fi. All apartments come stylishly furnished, the kitchenettes include a stove, cooking utensils, tea and coffee making facilities and a fridge. They all feature a patio or a balcony overlooking the garden. Local shops selling your everyday essentials are within 2 minutes' walking distance. In the garden there is a large table with plenty of chairs for relaxing or outdoor eating. There are plenty of chairs, cushions and hammocks. Perfect for relaxing, making friends and outdoor meals. You can check availability, prices and book online using the availability search facility below. The Beach Restaurant is located on the Gumusluk beach itself just a few steps away from the clear blue water of the Aegean Sea. These beautiful apartments have stunning views from their own balconies over the beach and sea. You will drift off to sleep every night to the sound of gently lapping waves. The apartments sleep up to 3 people and have their own kitchenette, en-suite bathroom with shower, are fully air-conditioned, plus of course a roomy balcony. In addition you have the added advantage of your own waterfront restaurant serving the delicious fresh food that Gumusluk is so famous for. The welcome that awaits you from the owner, Mujdat Ozcelik and his staff is unsurpassed. One stay with him will not be enough and visitors return time and time again to this idyllic corner of the Bodrum peninsula; not only because they have found simply paradise but because also they have made true friends.